Are you passionate about the rights, health and wellbeing of LGBTIQ+ Young People? Banyule City Council is proud of its diversity and believes that communities are better off when all people, regardless of their background or identity are embraced and supported to participate and contribute. 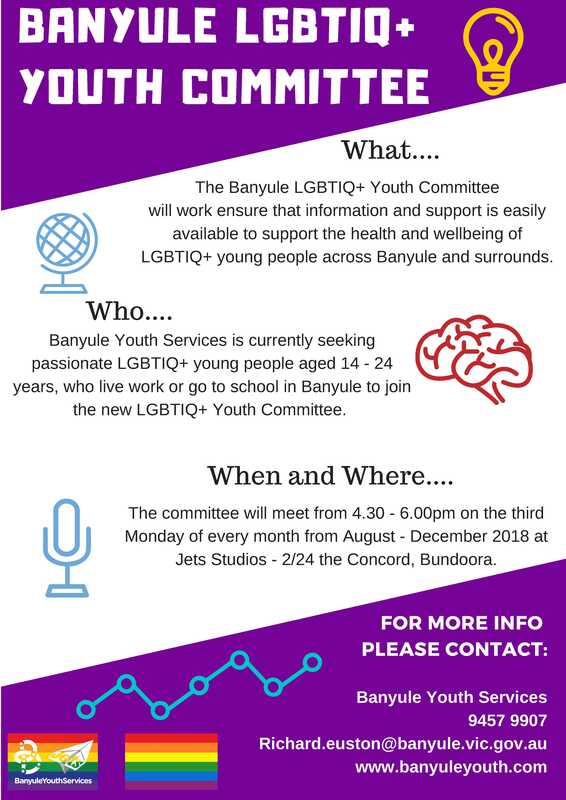 The Banyule LGBTIQ+ Youth Committee will enact the recommendations created by LGBTIQ+ young people at the 2018 Banyule Youth Summit by providing a vital link to the needs, aspirations and strengths of the local LGBTIQ+ youth community and to improve the availability of resources and information for LGBTIQ+ young people. Who: Young people who identify as LGBTIQ+ and allies aged 14 – 24 years who live, work or go to school or spend time in the City of Banyule. Meet new people, have fun and have your opinions heard. Provide advice on what range of information LGBTIQ+ young people should be able to access through schools, online and through social media. Advise on improving access for LGBTIQ+ young people to Jets Studios and Banyule Youth Services events. Share opinions and experiences to assist with the improvement of available supports, services and information for LGBTIQ+ young people across Banyule. How often: Meeting will occur of the third Monday of each month for a fixed term (August to December 2018) and each meeting will go for 1.5 hours each. Have fun, be positive and supportive of others. Prepare for, attend and actively participate in meetings. Take an active role in communicating the views of yourself and your peers.